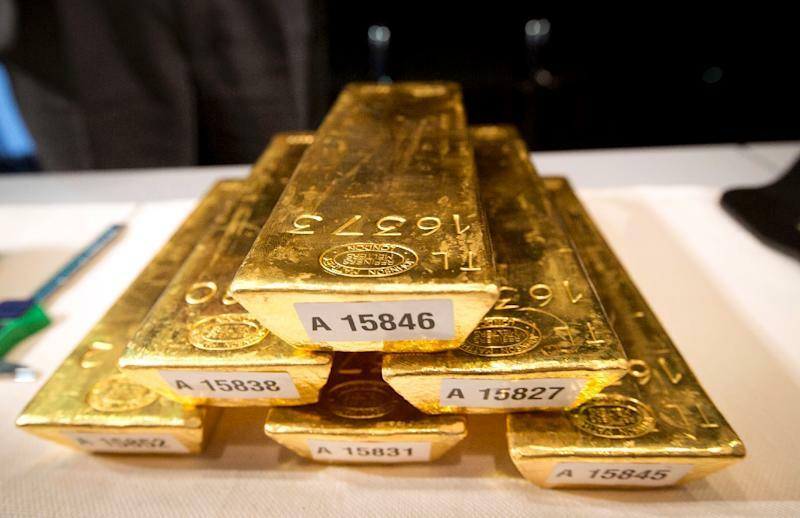 Frankfurt (AFP) - The German central bank or Bundesbank said Monday that it stepped up the repatriation of its gold reserves from overseas storage last year. "The Bundesbank successfully continued and further stepped up its transfers of gold," the central bank said in a statement. "In 2014, 120 tonnes of gold were transferred to Frankfurt from storage locations abroad: 35 tonnes from Paris and 85 tonnes from New York." Germany's gold reserves are the second-biggest in the world after those of the United States and totalled 3,384.2 tonnes this month, according to the latest data compiled by the World Gold Council. For decades the Bundesbank's gold holdings have been kept in the treasuries of other central banks -- in Paris, London and New York. According to the German central bank's own data, 1,447 tonnes are stored at the Federal Reserve Bank in New York, 438 tonnes at the Bank of England in London and 307 tonnes at the Banque de France in Paris. There were historical reasons for this. After World War II and the export revival of West Germany's "economic miracle" in the 1950s, the central bank accumulated dollars it swapped for gold at the Federal Reserve. With Germany split between capitalist west and the communist East German state until 1990, storing most of the gold abroad was a way to keep it out of Soviet reach during the Cold War. But surging mistrust of the euro during Europe's debt crisis fed a campaign to bring home Germany's gold reserve from New York and London, with some political parties fuelling fears the gold might have been tampered with. Under the Bundesbank's new gold storage plan in 2013, it decided to bring back 674 tonnes from abroad by 2020 and store half of its gold in its own vaults. "Implementation of our new gold storage plan is proceeding smoothly. Operations are running very much according to schedule," said Bundesbank executive board member Carl-Ludwig Thiele. "We also called on the expertise of the Bank for International Settlements for the spot checks that had to be carried out. As expected, there were no irregularities," Thiele said. Since the transfers began in 2013, the Bundesbank said it has relocated a total of 157 tonnes of gold to Frankfurt -- 67 tonnes from Paris and 90 tonnes from New York.